Or I should say I made two things! This could also be titled: That Time I Needed A Good Night Sleep. Or That Time I Tried to Get a Good Night Sleep. Okay fine, I’ll quit rambling and get right to the point. Like all good ideas, this one started when I fell down the Pinterest rabbit hole. Here’s what happened: I was waiting for my 12 year old to get his hair cut the other day while simultaneously yawning (me not my son) because, if you have pets, you know the struggle. It doesn’t matter how big your bed is, those furry friends want to sleep in your spot, smashed up against you, or on you. And it’s cute and cuddly when you’re just falling asleep and those little balls of fur are all purr-y and cozy. But then at some point during the night they turn into logs made out of concrete, making it impossible for you to move even a micro-millimeter. And just when you’ve managed some kind of bizarre super-human 4 a.m. strength to re-adjust them, they decide to it’s time to get up and play, and you wish you had let them stay sleeping. 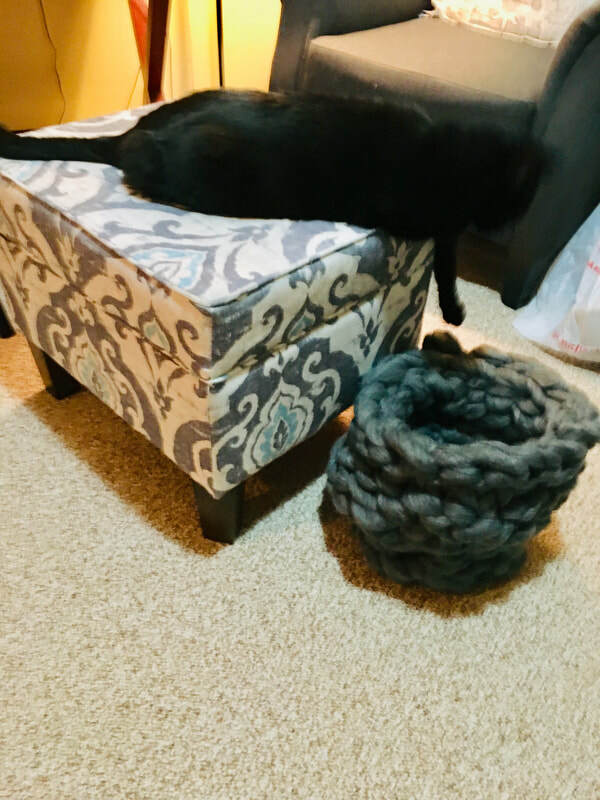 That’s when I saw some super cute hand crocheted cat beds and thought, AHA! 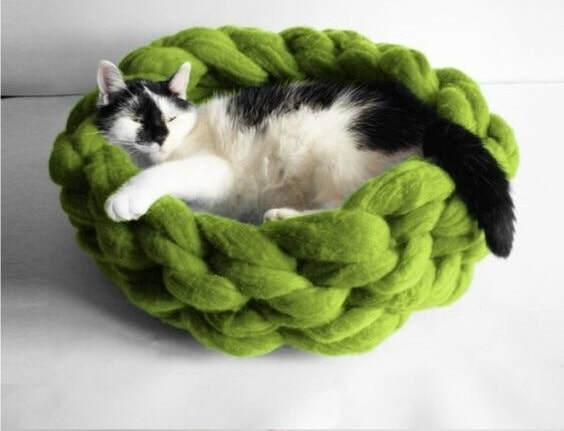 I can make those and of course my cats will love them, and we’ll all sleep tight forever and always. All I know is, as soon as my son’s haircut was finished, we were headed to the craft store to purchase 4lbs of bulky yarn. That’s how fast the Pinterest bug strikes. Beware. Like all things on Pinterest, it’s never as easy as it looks. There’s a windowsill in my kitchen. It’s the one above my sink. The one where I keep the knickknacks, the trinkets, the plant that I always forget to water, the clay creations my children have given me over the years, and the wishbones from meals past. It’s not that I’m a hoarder of wishes, it’s just that I’m forgetful. I put them up there to dry out and forget all about them- even though they’re right there ... in front of my face several times a day when I’m standing at the sink. This weekend though for some reason I noticed them - and I decided I needed a wish. I called my 12 year old son into the kitchen and explained how the magic of the wishbone worked. "We each think of a wish," I explained. "But only silently. Then you concentrate on that wish real hard so that the magic of the wish makes its way to the top of the bone - into that flat pointy part. Then we each grab an end and pull. Whoever winds up with the top gets their wish!" After looking at me like I was nuts, he agreed to play along. ​But what would I wish for? What does one wish for when given the opportunity for a single grand wish? FlashBACK FRIDAY: SUPER Secret Surprise ... Revealed!!! I knew I wanted to share the post I'd written back on October 15, 2011 when I brought these two sweeties home. ​I’ve blogged about it, I’ve tweeted about it, I’ve even Google+’d the fact that I had a super secret surprise. I wanted to tell you all about it, really I did, but I just couldn’t. It’s not that I was trying to be mean. Really I wasn’t. It’s just that I wasn’t 100% sure my super secret surprise was actually going to happen, and I needed to be sure before sharing the news. Well, now I am sure... so I guess I should tell you... Do you want to know? You've all been so patient, and I appreciate that. This weekend I was driving my car, picking up my youngest from a Bar Mitzvah (Mom taxi at your service), and the Rolling Stones came on my radio. To be honest, I’m not all that into the Stones, but I found myself humming along. The car I’m driving is new. At least it’s new to me. Back in November, when it was time to turn in my lease, I found a 2018 certified used car with low miles that had been a fleet car. Against my oldest son’s advice of “don’t buy a rental car” I bought it. Sorry son. I love everything about the car, but I have to admit I have not fully mastered all of the features. I chalk this up to old lady + technology. I’m getting there though. It took me way too long to figure out all the Bluetooth functions - it was complicated ok? And there were a bunch of beeps and chimes and blinks that had me searching through the manual. Turns out I have blind spot and lane departure warnings. It also turns out I desperately needed these and never knew it before. For those keeping track, this is my THIRD blog post now that talks about my psychic. Yes, she's gone from "the psychic" to "my psychic." No I haven't consulted her again, but I can't seem to stop thinking about some of the things she said. One point I forgot to mention is that I asked her about the "1's" and how somehow I always manage to look at the clock when it's either 1:11 or 11:11. And it's not just on my phone. It could be the clock over my stove or the clock in my car. I'm not saying I only look at the clock at that time, but I do somehow magically always seem to catch the ones and it's been like that for years. Also, it kind of freaks me out. Which brings me to today's Flashback Friday post, because I actually wrote about this back on July 7, 2012. Take a read, then I'll let you in on what my psychic had to say on the matter. When I woke up this morning, I had 111 unopened emails. Not only that - I took a screen shot and it turned out that was my 222nd photo. So now the two's are following me also?